It coats all parts of your mouth the instant it passes your lips in its luxurious, fatty creaminess. The texture of foie gras undoubtedly takes some getting used to that not everyone will clamor for but it does have its merits in the world of fine dining. When the ban struck California to prevent the purchase and selling of the delicacy, it caused an upset in the restaurant industry and sparked a conversation about the ingredient's nature. Is it wrong? Is it right? Is it ethical or not? The discussion became a dividing factor between food-loving friendships, yet there has not been a definitive moral answer to the subject. 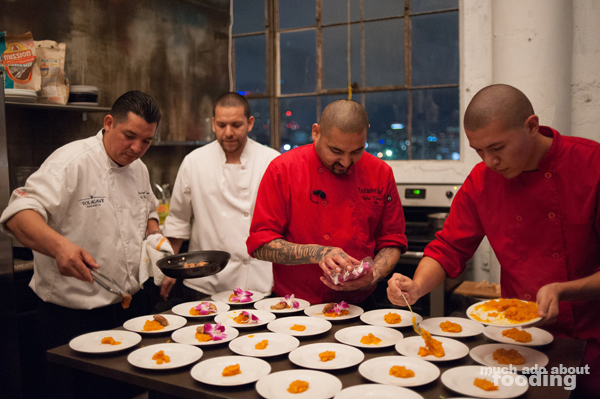 What it has done, though, is create a black market feel to the average consumer for this rare(r) item, and it set the tone last week for a secret dinner in downtown LA featuring some Orange County chefs. We waited for the text to come just 24 hours prior to the event, telling us where to drive to, and the "foiebidden" night soon began. The undisclosed location was revealed to us not too long before the dinner but we learned that non-media guests got their location information just hours prior instead of a full day. 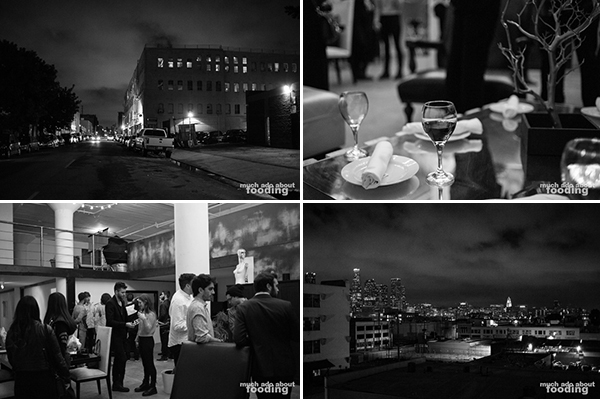 Set in downtown Los Angeles in a private loft down a barely lit alley, the event started off ripe with a hush-hush overtone. We rode up to the floor in a tiny elevator, fitting just four of us at a time, and found our way to a chic and simply adorned loft with an enviable view of the LA skyline. Strung cafe lights inside set the mood above the bare-bones kitchen space where the chefs for the evening were already prepping ingredients. 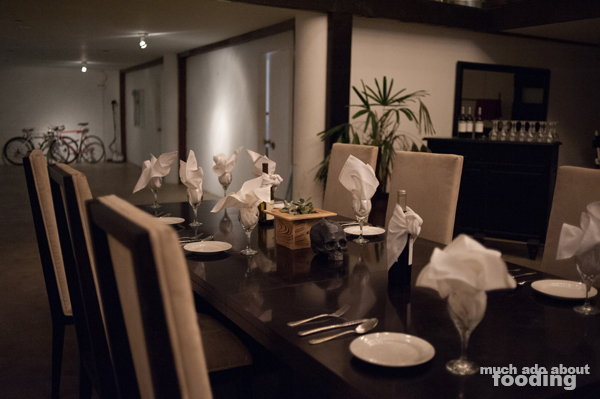 A black skull in the center of the dining table whiffed an air of kitsch but I overlooked it in anticipation of what would be cooked that night. 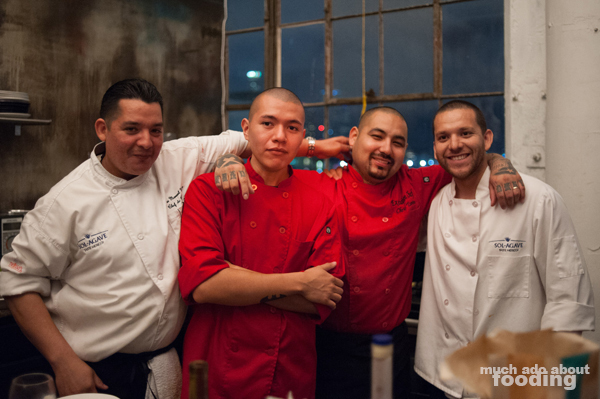 It was bound to be great - Chefs Chris Tzorin and Manny Velasco were on deck to sling their creativity with help from Anthony Tzorin and Sol Agave co-owner Jesse/Jesus. 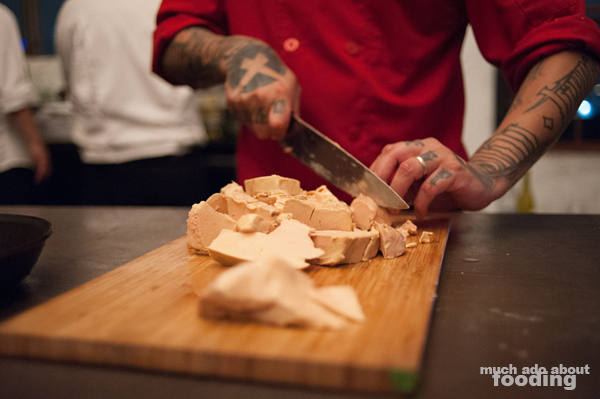 "Taking away foie gras is like taking away a color on an artist's palette." 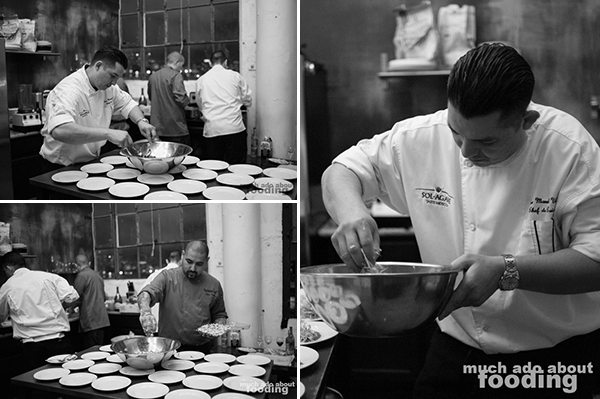 We spoke mainly with Chef Chris Tzorin who had extended the invitation to us that evening to attend. 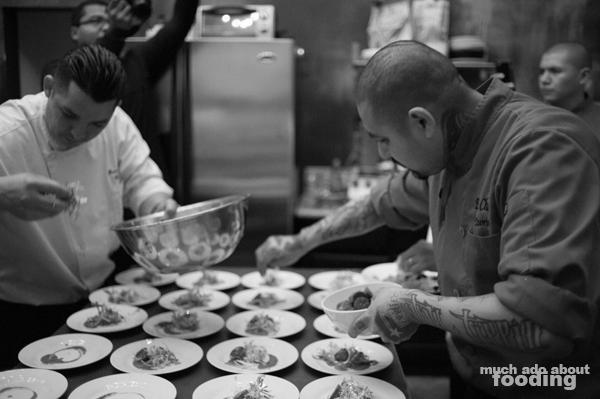 Having grown up in Newport Beach under the tutelage of his chef father (21 Oceanfront ring a bell?) and with training in fine dining, Chris had much reason to encourage the use of foie gras as he was accustomed to it being around. The secret dinner was meant to be an exercise in culinary artistry as the chefs were alerted of the location the same time we were and had to work with mystery baskets upon arrival. 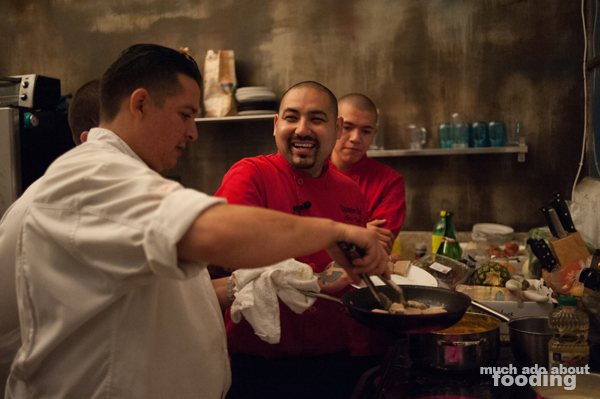 Chefs Chris and Manny built their menus based also on the inspirations drawn from music they listened to once they entered the kitchen. The event was, in part, exposure for FAKE MUSIC and their newest release, Noir EP by Yoann Feynman. The Parisian transplants were present at the tasting as well to witness and experience the artwork inspired by their own art. The crowd steadily and quietly grew as the night waned on but never was out of control. 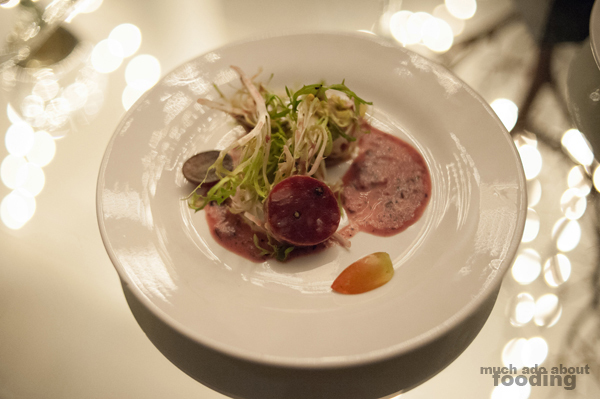 There were less than 25 plates to indulge in, and after some introductions and toasting, the first course made its presence. Chicory endive came out lightly dressed and on top of a blueberry sauce, scattered around by halved grapes and a slightly spicy slice of duck sausage. It was a pleasantly bright starter whose highlight was the sauce itself. The next plate could have fooled people into believing it was the foie gras itself from how rich and umami-laden the components were. 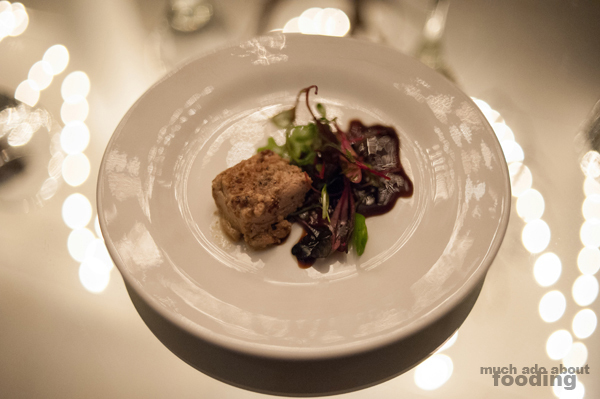 A flash-seared chunk of duck liver mousse pate flecked with black truffle placed on a balsamic reduction accompanied by bull's blood beet microgreens made everyone's eyebrow raise and then eased us all into satisfied sighs as the savoriness took over. We loved this use of actual truffle over the typical truffle oil or salt that has become ubiquitous in dining. A fatty hunk of truffle infusion is worth being secretive for. "You can take it off our menu but you can't take it off our plates." 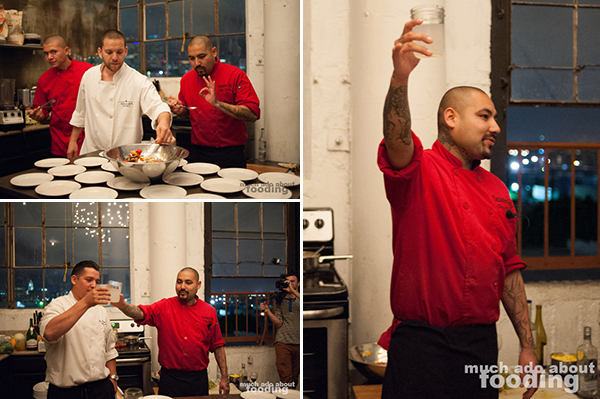 The main event made its appearance next after much hullabaloo as Chef Chris brought out the hefty package of foie gras. 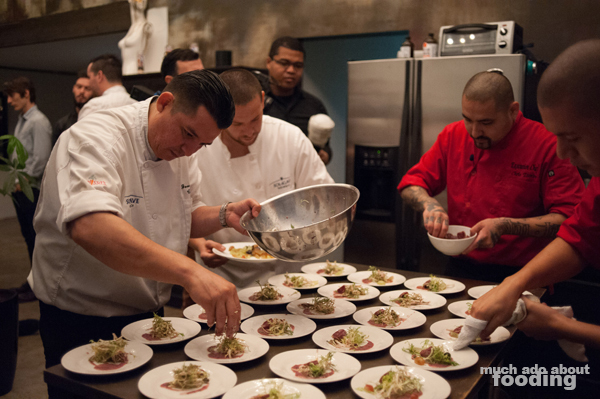 The fatty liver was swiftly sectioned off to workable sizes for the guests present, and all the chefs seemed relieved to be at this point. Though they could not disclose where the foie gras came from, it was a knowing non-verbal exchange that let me know the contraband is not exactly difficult to get ahold of in the industry. 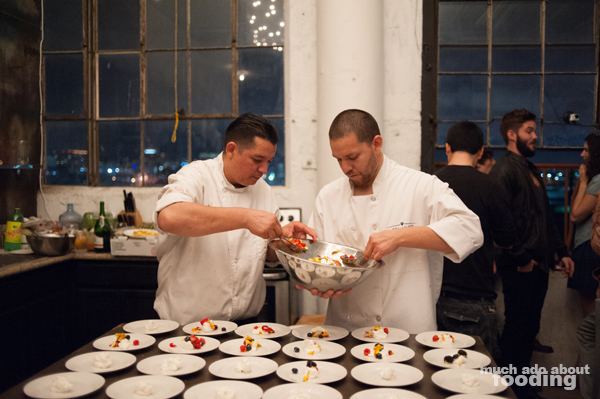 He had confirmed that with me earlier but the interaction between chefs that evening cemented that fact. Foie gras may be technically banned but all chefs have a way of getting this beloved ingredient into their hands and the mouths of their consumers. When asked what he thought of foie gras itself, Chris pointed out that people needed to be actively aware of the sourcing of all their ingredients if they are going to pick on one. One example brought up was in the same category as the source of foie gras - do people think about the practices in place that garner them the large duck breasts for dinner? His comments were brief on the subject but he did emphasize that at the very least, use the whole animal. 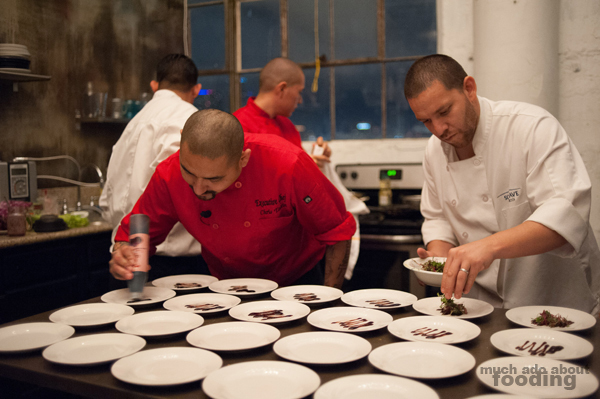 That was certainly shown with the generous portions of seared foie gras on everyone's plates. 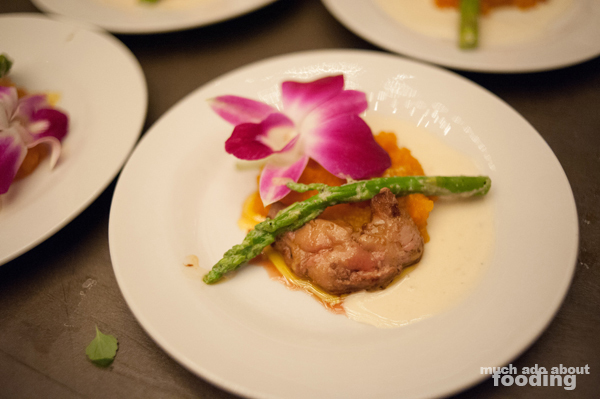 On top of a carrot puree next to roasted asparagus that had been drizzled with lemon buerre blanc, the foie gras was among friends. Creamily savory alongside creamily sweet and paired with a slight crisp from the spear, it did showcase well. 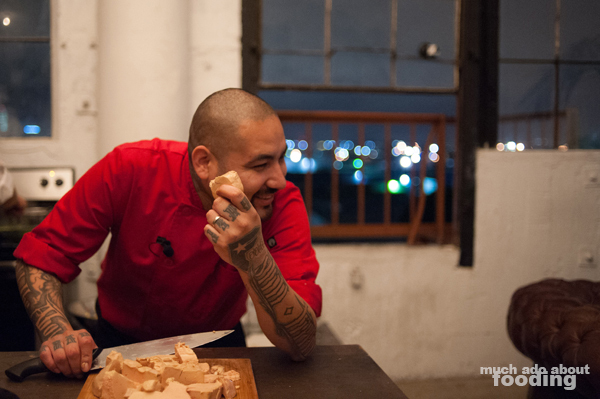 "I call it duck duck goose; to me, it’s a chef game. They can chase me all they want, but they won't catch me. 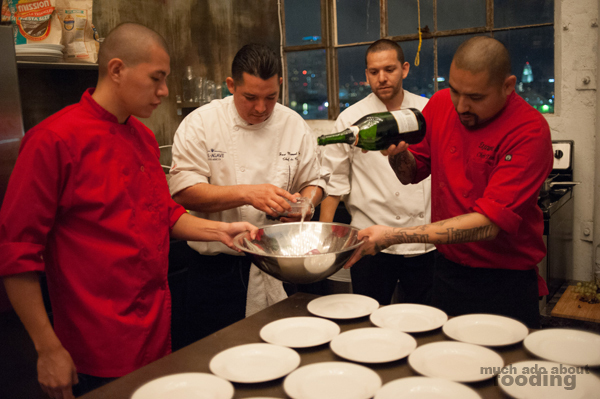 I hope all chefs do secret dinners because you have a chance to take risks and inspire others to step outside the box." 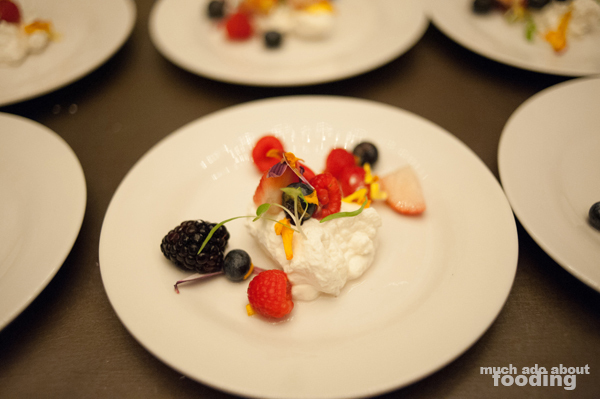 We ended the night with some freshly-made whipped cream, spun right in front of us all by Chef Manny, and some champagne-soaked, sugar berries and flowers. The cream was divine, and the sweetness from the berries was the final, satisfying note to the foiebidden meal. It was not your average dinner from the ingredients to the secrecy to even the lack of a menu (we figured out what things were from what we tasted and saw). 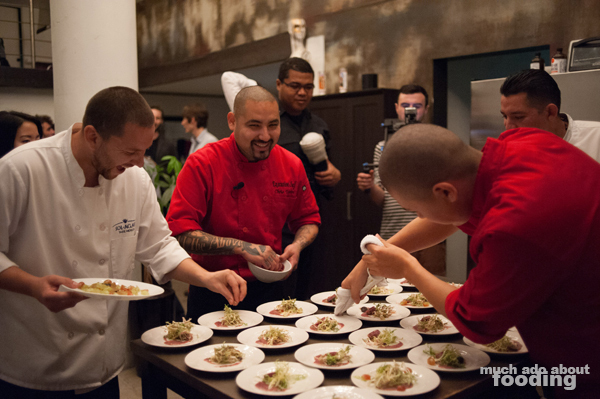 We're looking forward to seeing if other chefs will take this event as the spark for more pop-ups like this. At the very least, there would be more foie gras out and about.